Amherstburg native Michael DiPietro has played in his first NHL game. 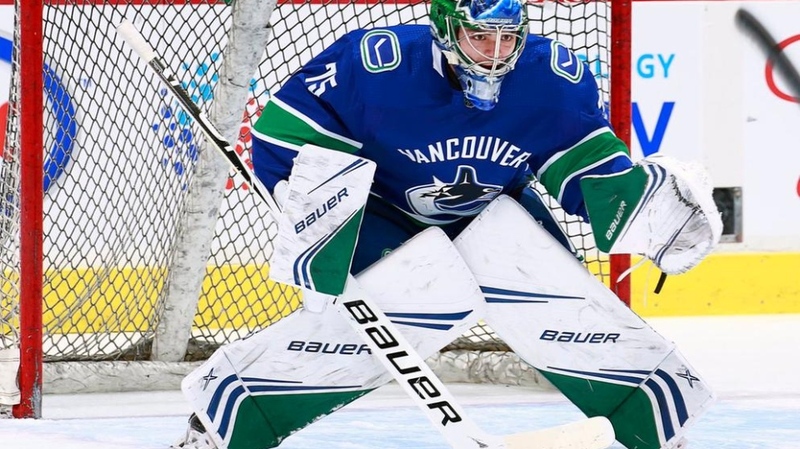 The 19-year-old DiPietro was called into action by the Vancouver Canucks on Monday night due to a lower body injury to Jacob Markstrom, but lost his opener 7-2 to the San Jose Sharks. "Definitely not the ideal first game," DiPietro said. "But it’s something I’ve dreamt about my entire life and to have the opportunity this young to do it, it’s something that’s positive for me, that I’ll take as a learning experience." DiPietro, who led the Windsor Spitfires to the 2017 Memorial Cup, was called up from the Ottawa 67’s of the OHL on an emergency basis last week after Canucks backup netminder Thatcher Demko suffered a knee sprain. "When you focus on the negatives too much, you’re going to feel like an ant in the net," said DiPietro. DiPietro stopped 17-of-24 shots and despite a rough start, he "hung in there and battled," said Canucks head coach Trevis Green. "I don’t feel bad at all for putting him in the net. He’s here, he’s the backup. I didn’t have another choice. That’s who we had to play tonight," the coach said. The victory for San Jose (34-16-7) moves the Sharks into first place in the Western Conference and extends their win streak to six games. “Honestly, I think he played a heck of a game,” said Horvat of DiPietro. “He made some unbelievable saves out there. We hung him out to dry for a lot of those goals and he had no chance on them." DiPietro was selected 64th overall by the Canucks in the 2017 NHL Draft.